COUNTRY ANGLERS’ owner, Jac Ford, grew up with a fly rod in his hand. He took up fly fishing in grade school, first fishing for Blue gills on Wiggins Lake, near Gladwin. He was tying his own flies by the fifth grade and begin fishing for trout by age twelve. Jac was lucky, having a couple mentors in Vic Sandvic and Ralph Taylor, who both contributed much to his development in becoming an adroit fly-fisher for trout and other fish. Before graduation from high school, he was an avid fly-tier and fly-fisherman. In 1962, at the age of twenty-two, Jac became a “catch and release” fisherman of Michigan. By 1972, Jac’s best catch, JoAnn, came along and since has been very supportive of his fishing passion. Jo Ann later became a fine fisher herself. It was then that Jac began fishing for Steelhead, and in 1973, he began fishing for trout yearly in Montana and other out-of-the-country fishing venues. During this time, Jac fished the Per Marquette for steelhead for ten days each spring and countless days wading a small river or the Manistee and AuSable river right here in Michigan, every spring starting his trout fishing at Traefa Lodge, on the main stream of the AuSable on opening weekend. Jac also chased the Brown and Gray Drakes and the Hex hatch, sometimes driving back and forth to and from Saginaw so he could squeeze in working a few times a week. 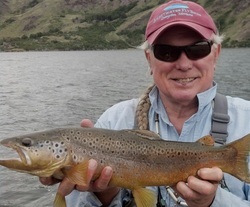 Jac has had a wonderful experience being involved with Trout Unlimited and Federation of Fly Fisherman, having been a life member of both since the early seventies. Three-time president of the Mershon Chapter of Trout Unlimited and 2013 recipient of TU National's "Distinguished Service Award," Jac is currently serving as president of the Mershon chapter. Jac began fly tying and fly fishing classes to support the chapter in 1976. Other than several years in the 80’s, Jac has been instructing these classes. Many particpants from the classes have become active members, board members, and chapter officers. Jac continued fly fishing in Montana for a few weeks every year until 1991, when he retired. After fishing there for a month with some friends shortly after retiring, Jac became a guide in Montana and an outfitter two years later. Jac had his own fly-fishing outfitter business for the next ten years. With Jac’s expertise in trout fishing in Montana, he developed a fully booked repeat business, after being in business for only one year. Jac took people fishing to rivers, spring creeks, Yellowstone Park, and private lakes, having fished the spring creeks for twenty years before becoming a guide/outfitter. He loved the challenge of fooling trout on small flies during large hatches. Some of the rivers he took people to fish on were the Big Hole, Beaverhead, Blackfoot, Missouri, Madison, Big Horn, and the Yellowstone River. He did so because he loved the challenge of fishing in different places … and with this variety of rivers available to the other people, they didn’t get stagnant. He found some of the best fishing in the west on some of the lakes. The hatches were phenominal, and the fish were large and actively feeding on the bugs. Jac’s love for food and cooking was a plus out west, as lunches were a major player in the fishing experience. One of his favorites was rack or lamb, and we could usually find a drink of varied nature to salute the day. During these years of fishing within in the states, Jac was fortunate to fish in Ontario’s Ungava Bay for Atlantics, went to fish the Bow and Crowsnest in Alberta, and the south island of New Zealand on many rivers. These trips will always be cherished. Some of the days on the Bow River were the best trout days in his life; they just were unbelievable. But, the “coup de grace” was his two six-week fishing trips to New Zealand, where several double-digit browns and rainbows were landed each trip. Today, Jac guides in Michigan on the Pere Marquette River for steelhead, trout, and salmon during the spring and fall. In May and June, hatch fishing nymphs and dries on the AuSable River near Mio, Michigan, are the primary fare, with September through December hooked on streamer fishing for trophy brown trout on the AuSable in Michigan. Believe it or not, even with our snowy Michigan winters, September through April are prime time for streamer fishing in Michigan. Jac is really into chasing "trophy browns" with large streamers. During 2012, Country Anglers started a club called the 20-Plus Streamer Club. Check out the club by clicking here.